To properly calculate excise taxes in the oil and gas industry is a complex task. Tax rates are affected by each process in using different products, blends, branded, unbranded, bio fuel blends, origins, destinations, gross or net volumes, effective dates and exemptions. In North America you are facing different tax rates regulated from Federal Government, State Governments and Local Governments. These jurisdictions change rates several times a year independently of each other. Invoicing your customers is the most important way people communicate and interact with your organization. Correct invoicing is the lifeline of company and basis in building trusted relationships. "Get it right the first time!" should be the overall target. How does AvaTax SAP Connector work? 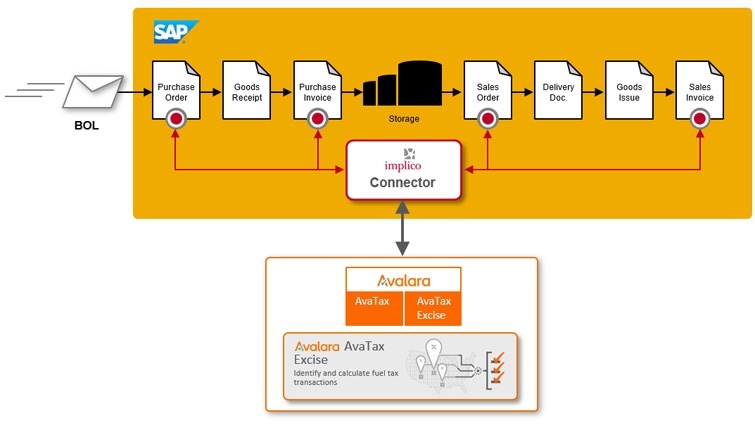 To address these needs Implico has partnered with tax specialist Avalara to build a connector from SAP ERP to their proven tax tool AvaTax Excise. AvaTax Excise enables relevant tax determination and calculation for the numerous processes found in the oil and gas industry. Implico's AvaTax SAP Connector is integrated into SAP's standard sales and purchasing pricing functions. The package provides a fully functioning pricing procedure with all tax conditions and the connector logic. A separate configuration tree allows for specific custom requirements as well as to adjust mappings for the interface. The graph shows a typical fuels document flow for purchase and sales with the access points to the external tax engine from our partner Avalara. Learn more about tax processing with AvaTax SAP Connector! We would be delighted to answer your questions about AvaTax SAP Connector and its innovative functionalities.